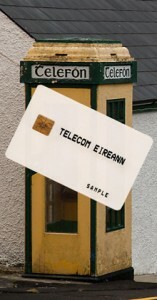 Throughout the years Telecom Eireann and Eircom implemented four different Cardphone hardware models. 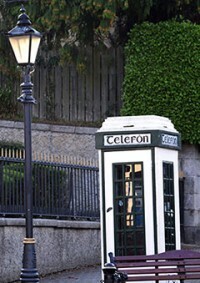 Initially starting off with separate coinphones and cardphones Eircom was to later bring out a hybrid coin and card payphone, which is still in use today. The Cardphone manufacturers used over the years were produced by both Schlumberger and Landis and Gyr. In the image to the left you will see a Telecom Eireann cardphone. 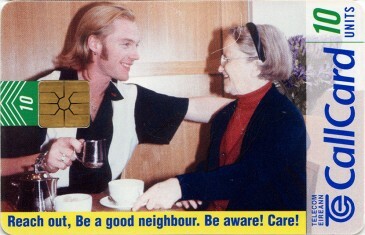 This is identifiable by the yellow sign. This sign stated "Telecom Eireann Cardphone - Calls without coins". Four different models supporting are known to have been used by Telecom Eireann and later Eircom. While most collectors will be aware of the extremely rare Irish Management Institute (IMI) Callcards, for many it is a mystery as to why three private Callcards were produced for two different IMI conferences in the years 1989 and 1990. The IMI Callcards are among the first of all private issue cards, with only the Cork FITCE being the other trial Callcard to see a private card produced.